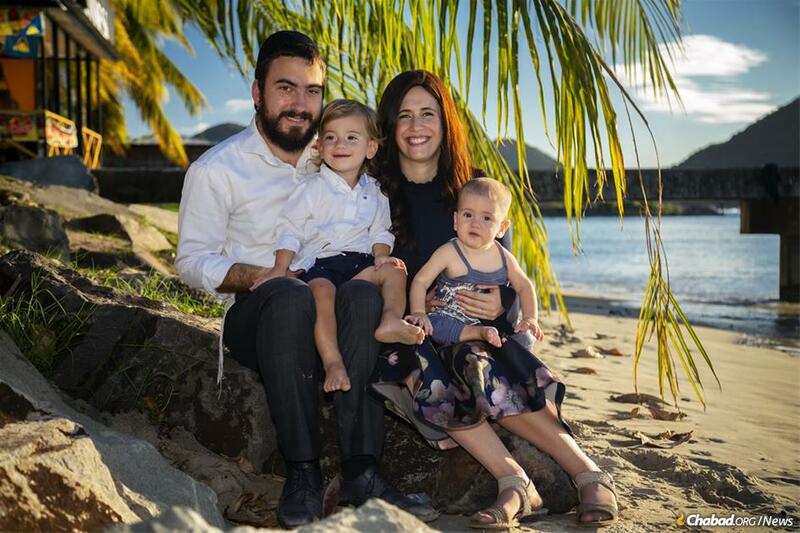 Rabbi Avromy and Sternie Super, and their young children, recently moved to the Caribbean to open Chabad of St. Lucia. 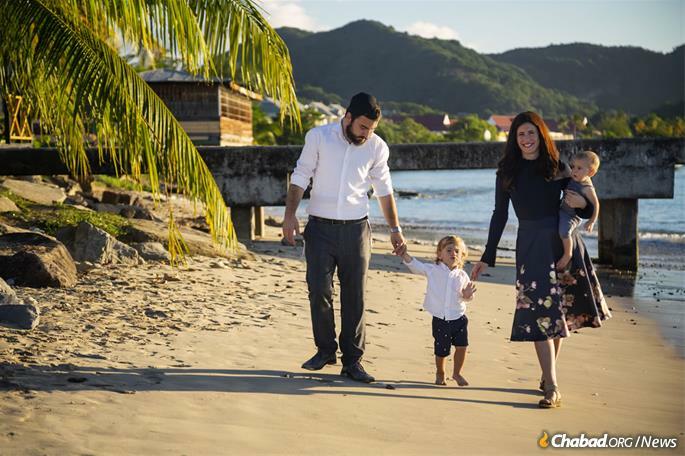 When Yaniv and Marcia Gliksman, and their children moved a few years ago to St. Lucia—an idyllic island nation nestled among the Windward Islands at the eastern edge of the Caribbean Sea—they found warm waters, inviting beaches and tropical forests. While the towering Pitons—St. Lucia’s iconic twin volcanic spires—offered scenic vistas, a Jewish community was considerably harder to find. While other islands in the Caribbean, such as Barbados and Jamaica, have Jewish communities that date back hundreds of years to Sephardic Jews fleeing Spain and Portugal during the Spanish Inquisition, St. Lucia never had a dedicated synagogue building or an active Jewish community. Save for visits from rabbinical students in the Merkos Summer Visitation program, there was never ongoing Jewish guidance or activities. Until now. 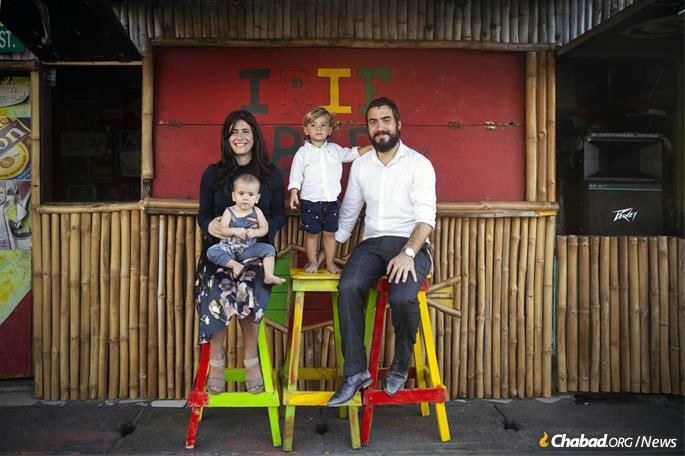 Rabbi Avromy and Sternie Super recently moved to the island to open Chabad of St. Lucia. The Supers, who first visited in December 2017, have begun to assemble an eclectic Jewish community of locals, snowbirds and tourists. Their posting was formally announced at the International Conference of Chabad-Lubavitch Women Emissaries in New York. The island nation has attracted foreign business and investment, especially in banking, but for the most part, its economy is based on tourism and the local banana industry. 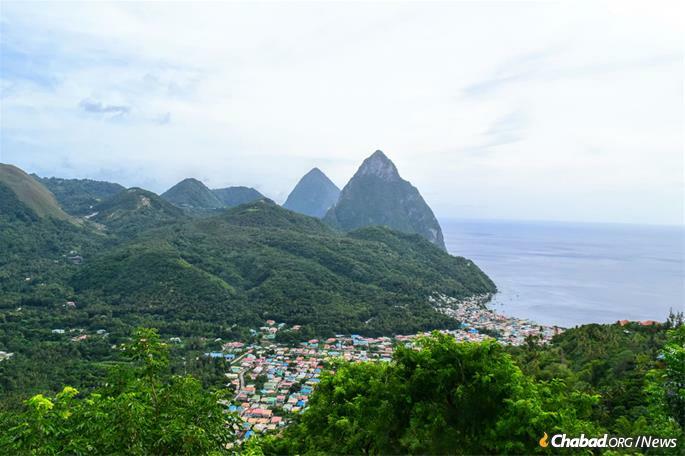 While the towering Pitons—St. Lucia’s iconic twin volcanic spires—offered scenic vistas, a Jewish community was considerably harder to find. 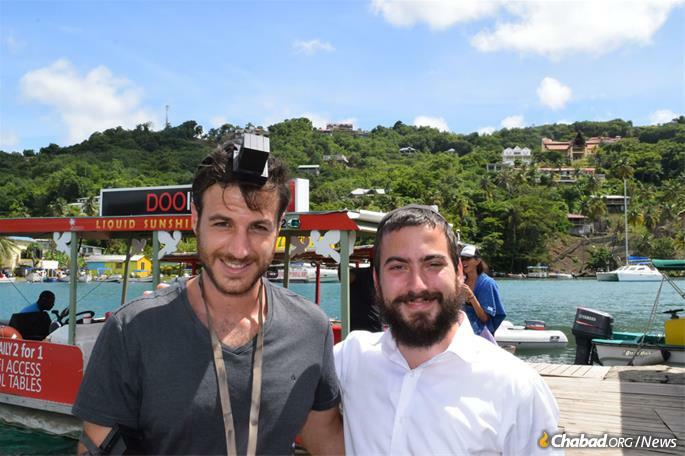 He estimates that about 200 Jewish residents live on the island at least part of the year, with tens of thousands of Jewish vacationers passing through St. Lucia annually. With its capital of Castries, the island covers a land area of more than 200 square miles and has a population of about 180,000 and growing. 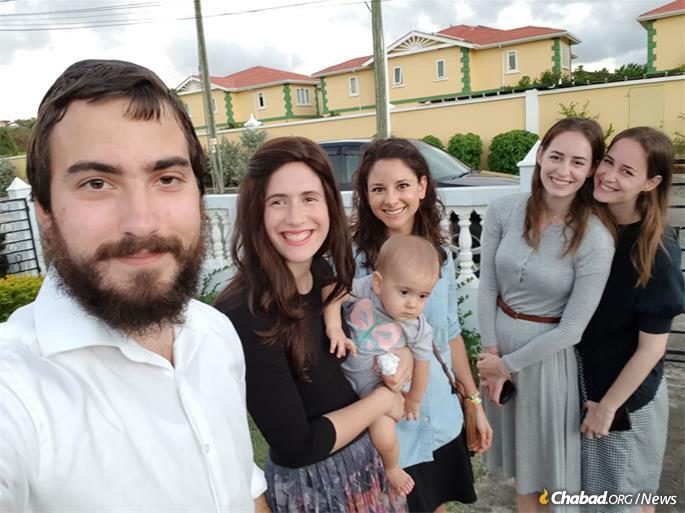 On an island where all roads eventually lead to the sea, the Supers have found people interested in joining Chabad’s activities simply by walking the sun-drenched streets. The Supers have tapped into the island vibe in crafting their programming. In addition to Torah classes and Shabbat meals, they host weekly barbecues that have been attended by 30 or so people. Sternie even uses her shopping at the local market with friends she’s made in the community as an opportunity to bond and teach. With permanent residents and throngs of tourists, there are plenty of opportunities to spread Judaism. 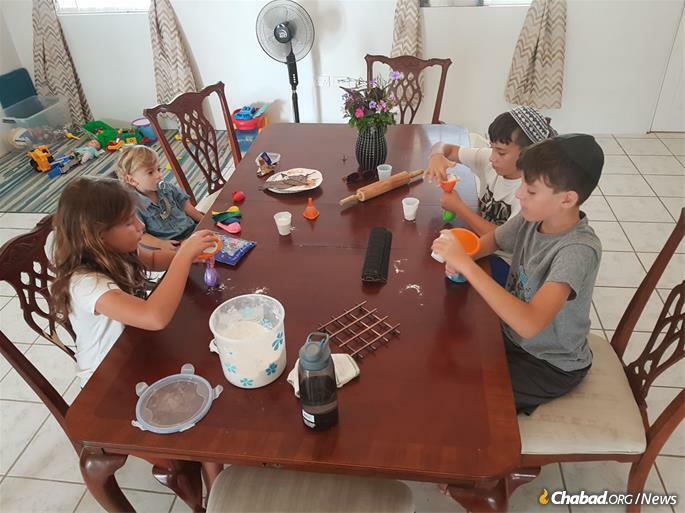 The Supers also run a small Hebrew school attended by the Gliksmans’ 10-year-old triplets—Avigail, Michael and Matan—that meets every Wednesday after school. 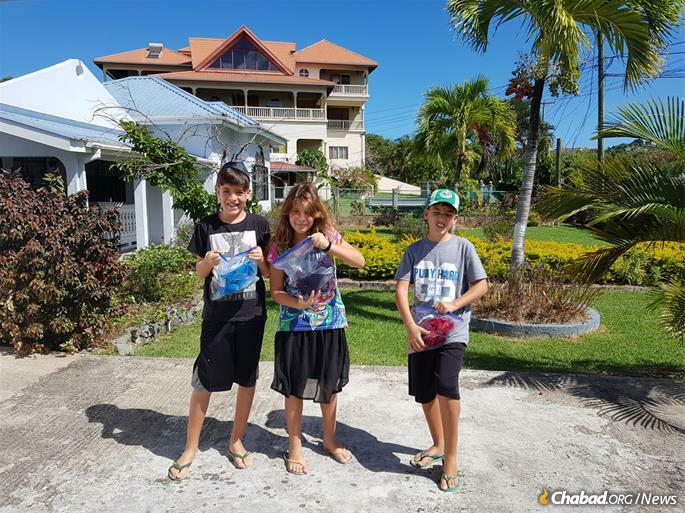 Chabad of St. Lucia is under the auspices of Rabbi Mendel Zarchi of Chabad of Puerto Rico, the point person for Judaism in the Caribbean, and made possible in part through the generosity of the Gad brothers, the owners of Diamonds International. The Supers have found new friends and are always looking for more. One of the first steps was to establish programs and a school forJewish children. Families gather for the holiday of Chanukah. 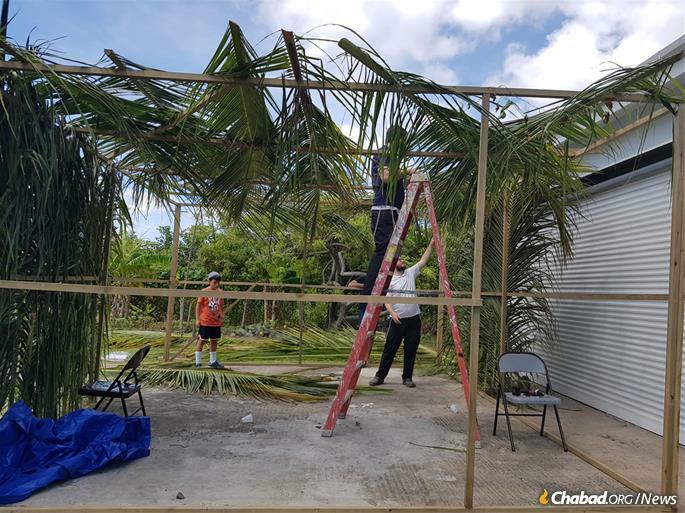 Sechach, the covering for the roof of a sukkah, is easy to find on a tropical island. Reaching out to Jewish residents and visitors of all ages and backgrounds. Kids in the Hebrew school show off their projects. 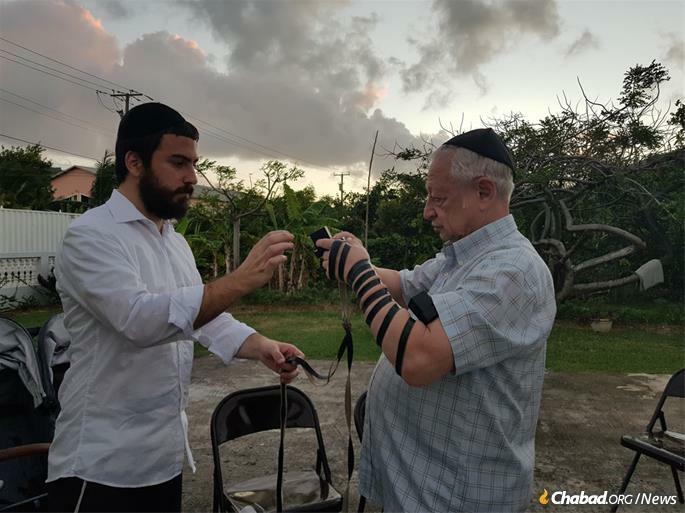 “Every day, we meet new Jews that tell us despite coming to St. Lucia every year for years, even decades, they thought they were the only Jews here,” says Sternie Super. The Supers have tapped into the island vibe in crafting their programming. In addition to Torah classes and Shabbat meals, they host weekly barbecues that have been attended by 30 or so people. 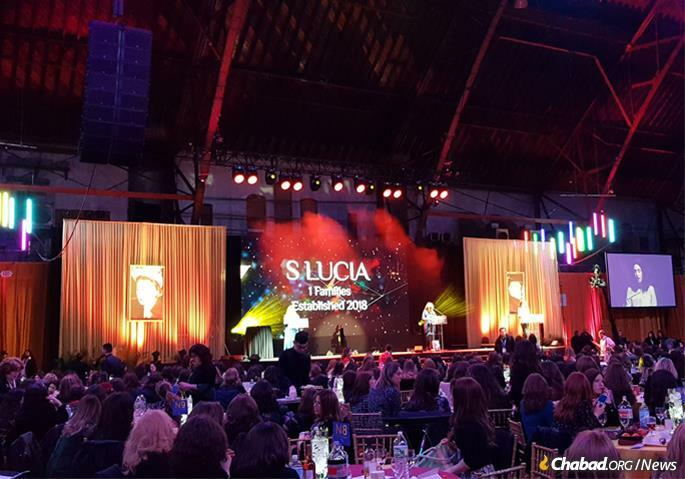 The new Chabad center was added to roll call at the International Convention of Chabad-Lubavitch Women Emissaries. new community in S. Lucia Island What a great idea. May you all be blessed with the merit (zechus) of beginning something totally new, what a beautiful mikvah! Keep us posted on your success. Can we get Chabad.org there? I was proud to complete the minyan, as the 10th man, for their first full Shabbat morning service, during December 2018, just after Chanukah. And, I was the first to hold the sefer torah prior to the first full leining on a Shabbat morning.